“All right, see you later.” As I pulled away from the curb, I thought I heard the man yell out Candy’s name. But when I looked in the rearview mirror, I didn’t see her anywhere. The place was creepy, almost as bad as the graveyard at the back of my house. I couldn’t wait to get out of there. But as I drove home, I got the feeling that Candy wasn’t being honest with me and that maybe she was in some sort of trouble. I got back home, not able to even think straight because I kept having the feeling a bug was crawling on me. Since I promised my mother I’d work in the yard, I headed out to the side garden I called the Wasteland. I was just about to start weeding, but that pesky raven landed on my fence, staring at me as if it were trying to tell me something. It looked creepy, so big and black and with those beady eyes. If the ghost of my Aunt Bestla hadn’t told me the raven was my animal guide, I would have thrown something at it to make it fly away. “What do you want?” I asked, as if the bird could understand me. Its head went up and down, and it continued to squawk. Something inside told me the stupid bird wanted me to follow it. It took off, flying toward the graveyard. I tried to fight the urge to go after it. My hand shot out to cradle the crystal of my necklace, rubbing it like some kind of Aladdin’s lamp. Heat emanated from it, so hot it felt as if it were going to burn my hand. Touching the crystal only made the urge to follow the bird stronger. “Patience,” I heard a sibilant whisper on the breeze. A chill ran up my spine. This reminded me an awful lot of when Mary invaded my head, and I heard the zombies from the graveyard calling out to her. “Patience,” came the whisper again. I didn’t know what that could possibly mean. Was someone or something telling me to be patient? Without realizing what I was doing, I put down the shovel and headed to the back of the yard, walking directly to the graveyard. The wind picked up, and the breeze became cooler. The sky clouded over. I heard thunder rumbling in the distance. There was a storm coming, no doubt about it. The raven sat on a branch overhead as the tree swayed back and forth in the wind. Dead, dried leaves scurried across the ground making a dry rustling sound. My heartbeat picked up. I hadn’t been to the graveyard since I had my last encounter with Mary, Mary. I stopped at the edge of our yard, not wanting to take that final step to cross over the boundary into the land of the dead. “Patience,” came the whisper again, but this time it was much louder. I was sure it was coming from somewhere inside the graveyard. The raven flew down from the tree, landing atop a tombstone about five over from the creepy zombie’s grave – the one that was named James. A shiver of fear coursed through me, remembering my awful encounter with this place. I headed straight for the stone that the raven sat perched upon, not sure what was driving me forward, but I felt like I had to do it. Stopping at the foot of the grave, the raven called out one last time before heading back up to the tree. I looked down, not able to read the name carved into the headstone because it was worn out, very old and covered with moss. This grave was a little different from the rest because it was on a small knoll and higher than the ones around it. There were tufts of grass surrounding it. Lightning flashed overhead, causing me to jump at the same time thunder crashed. The sky was going to open up and start pouring at any minute. I knew I should get back to the house, but the intense need to know whose name was on the stone kept me from leaving. I knelt down and bravely reached out to run my fingers along the gravestone. The rain started to fall around me. Then I scratched away the moss, able to see the engraving underneath. “Thomas . . .” I read aloud, feeling curious, frightened and excited all at the same time. “M . 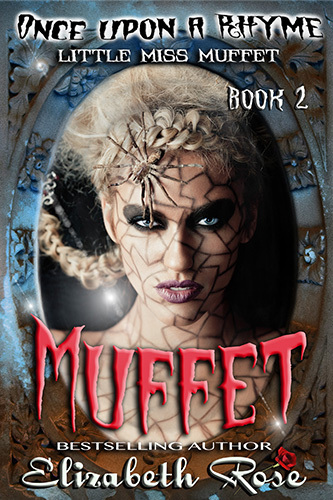 . . u . . . f . . . f . . . e . . . t. Muffet. Thomas Muffet,” I said. Right when I said the name, a big old spider dropped down from the tree branch and landed on my shoulder. I screamed and brushed it off of me, trying to get to my feet as fast as I could. In my haste, I stumbled and fell backward atop the grave. As I lifted my head, I saw a million little spiders emerging from the tombstone and spreading out over the ground. “No!” I cried, pushing up to my knees. At the same time, out of habit, I grabbed my crystal to calm me. That’s when I heard that awful clanging noise again that sounded like an old ship’s bell. “Uh oh,” I said, feeling suddenly lightheaded and dizzy. The ground began to spin beneath me. And when I tried to stand up, I blacked out and fell back down.